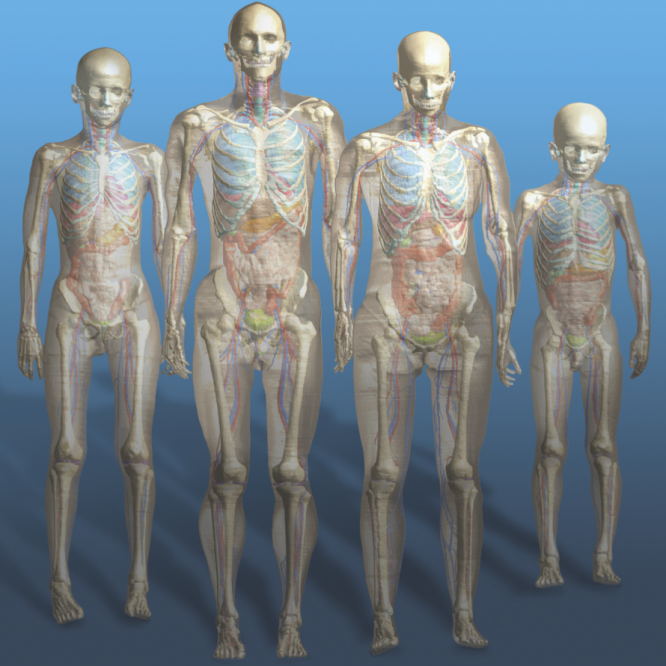 The Virtual Family computational whole-body anatomical human models were originally developed for electromagnetic (EM) exposure evaluations, to study how absorption of radiofrequency (RF) radiation from external sources depends on anatomy. The expanded Virtual Population provides considerably broader population coverage with the inclusion of models of both sexes ranging in age from 5 to 84 years old. These original models have proven invaluable for EM dosimetry. However, for safety evaluations of diagnostic and therapeutic applications, including for magnetic resonance imaging (MRI) with medical implants, significantly enhanced models were needed. In this paper, we describe the research and development performed to obtain anatomical models that meet the requirements necessary for medical implant safety assessment applications. The results are a set of anatomically independent, accurate, and detailed models with smooth, feature-rich, topologically conforming surfaces. The impact of the improvements is demonstrated for the MRI exposure of an adult woman with an orthopedic spinal implant. Future developments include the functionalization of the models for specific physical and physiological modeling tasks. Resegmentation at higher resolution, with enhanced surface processing, and numerous anatomical refinements. Implementation of quality control procedures for more-consistent tissue assignment. Compilation of a comprehensive tissue properties database to complement the library of models. Posing tools to expand the posture space covered. Multiple morphing tools that allow variants of existing models to be developed.